Join us as we help one of our partner organizations – Horizon Wings Raptor Rehabilitation Center in Ashford CT with their annual spring clean-up. Horizon Wings is a non-profit Wildlife Rehabilitation Center specializing in Birds of Prey. Their mission is to rehabilitate birds of prey for release into the wild in order to maintain their population and to educate the community to enhance awareness of the environment. All of their funding is provided by educational programs and donations. 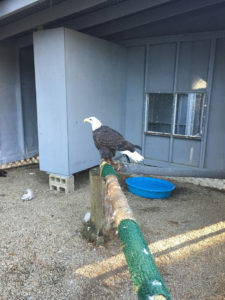 They have several raptors that cannot be released back into the wild due to their injuries, and, fortunately, they are able to keep these birds at the center and, with a special permit, use them for educational programs. During their annual clean-up day volunteers help to rake leaves and clear debris that may have accumulated around the grounds of the facility. Horizon Wings has several large buildings where both injured birds and program birds live. These buildings need regular maintenance and upkeep as well as the grounds and support facilities. Members should bring work gloves and rakes if you have them. Following the clean-up day members can enjoy snacks and cold drinks well as the chance to meet some of the program birds, including the bald eagle Atka and golden eagles Chrysos and Skywalker. The day promises to be fun, helpful and educational. We hope you’ll join us as we work together to help this important nonprofit organization doing good work here in The Last Green Valley.